My sister wants to dye her hair. I don't think she should. In 9th grade, I dyed my hair for the first time. I put blonde highlights in it. My hair was basically the same color as hers. 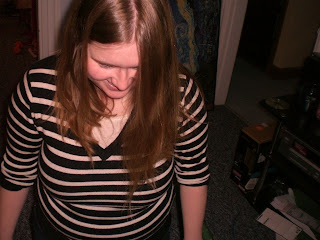 Then I kept going lighter blonde until freshman year of college, when I went red. Bright red. Clown red. It was a drastic change. I was going to pull up a picture of me with blonde hair, but they're all so hideous. So, I'm not going to do that. Maybe tomorrow. But this was the brightness upon first dye. 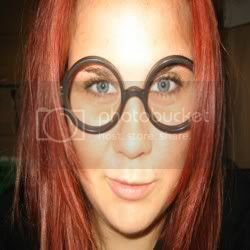 Also, I am Harry Potter. Sometimes I miss being blonde, but having red hair changed me. I don't know how to explain it without sounding like a cheesy movie, but it helped me come out of my shell and discover myself. God, I hate myself. Anyways, she claims that our natural "dirty blonde" hair is ugly. Betsy: I hate it. Its like the color of nothing. Its like what nothing would look like. I don't think so. I think nothing would look like this. What is so great about her hair is that her roots are showing and she has never even dyed it. How is that even possible?